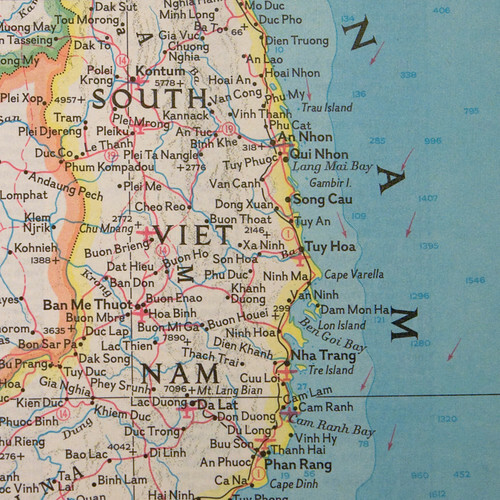 As you might have read in the archives of this site, I’ve been working on a project called retrotravels.net. 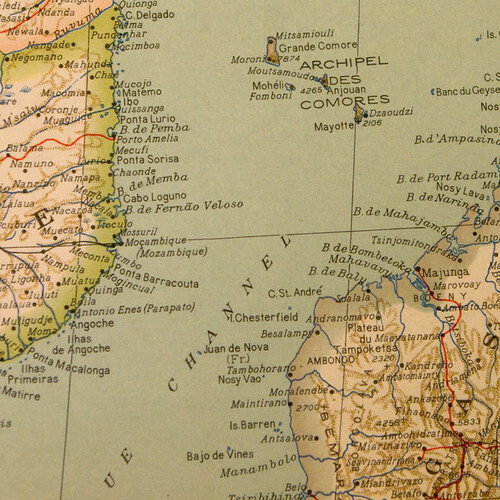 The site will allow you to explore some of my collection of guidebooks used during the Golden Age of travel (1880-1939). 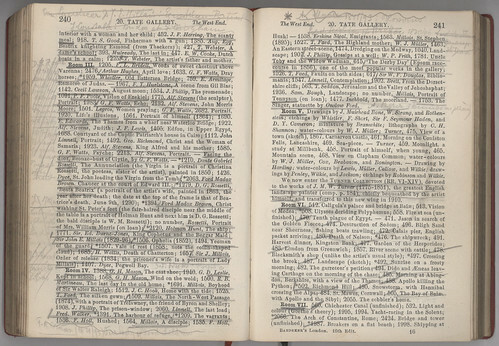 You will be able to peruse books not for what is printed on the page (which is interesting in itself) but rather the lingering proof that the book was used by its previous owners. 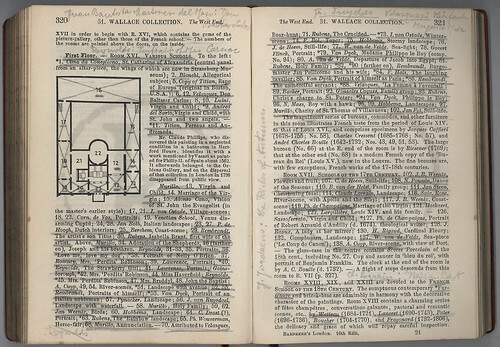 Notations and marks on the pages (called marginalia). Museum or transportation tickets. Scribbled notes. 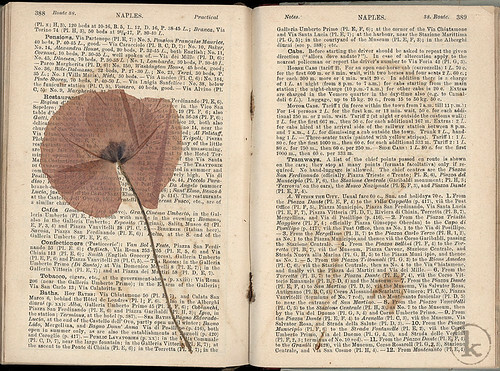 A pressed flower that has made a home between two stained pages for over 70 years. Little pamphlets on a tourist location folded into the pages. 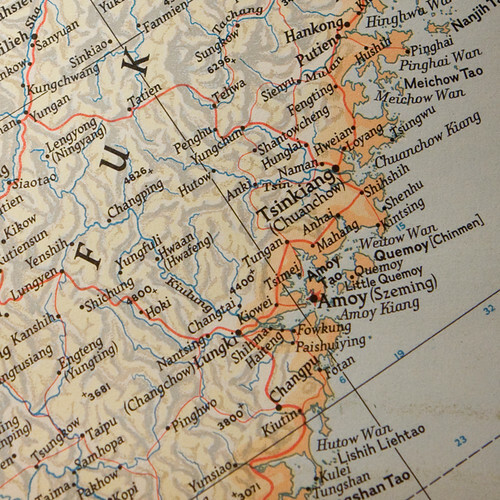 I believe that these books hold a forgotten history of a overseas trip and, if studied carefully, can reveal what the traveler from the past did with the book, where they traveled, and what they saw. I’m still working on some major layout and design issues and how to express my fascination with the books. Luckily, I’m not alone in this fascination. 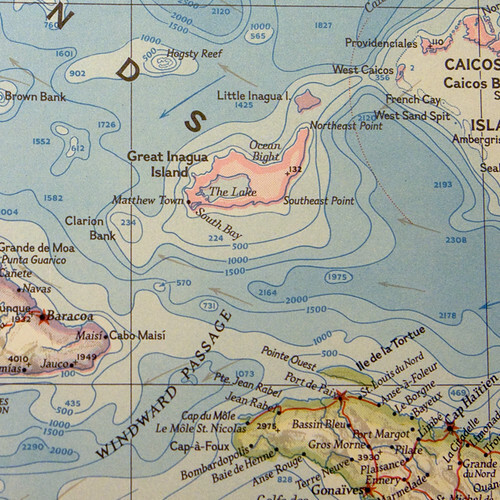 RadioLab, a weekly NPR program about… well… everything. 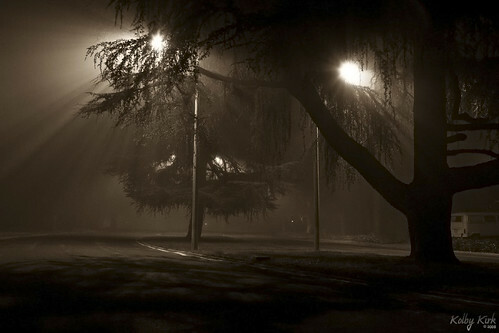 One episode was about the history of War of the Worlds and its effect on those who heard it when it was broadcast. 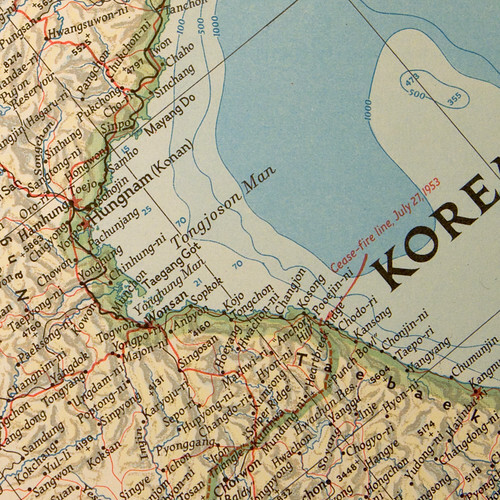 Another hour-long broadcast was about the language of music and how the brain processes sound. Another was on the history of sperm. All of their programs are well-produced, entertaining, and discuss fascinating subjects. 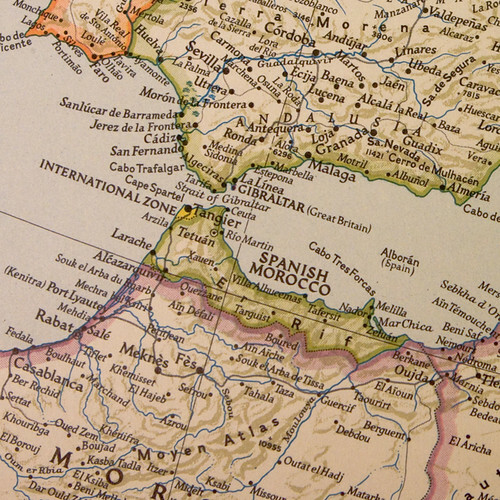 Forensics, archeology, genealogy, and genetics are devoted to figuring out what really happened. 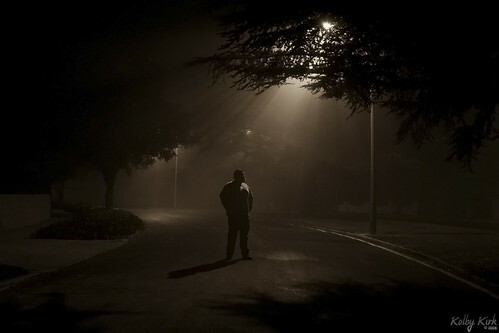 In this hour, we hear surprising stories of playing detective and finding that what really happened in the past is not at all what you’d expected. 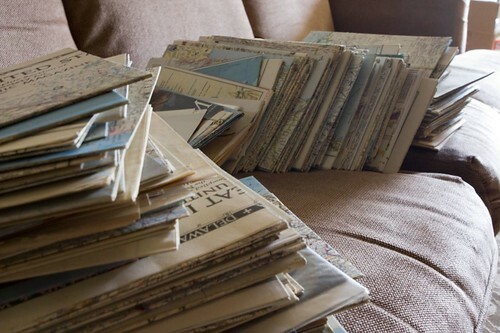 One of the three stories they discussed was about a mysterious pile of old letters found on the side of a rural road. If it wasn’t for the spotting of a goat standing on a cow, the discovery would probably never had happened. I suggest listening to the program and hopefully you too will understand my fascination with these ghosts found in ephemera. 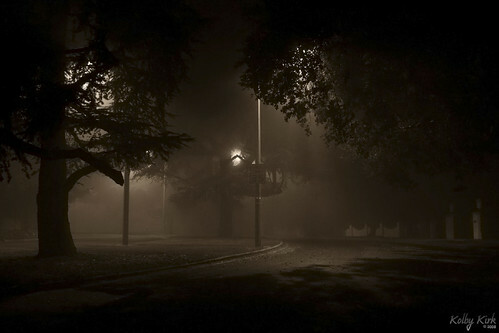 A night of thick fog is rare here in Arcadia. 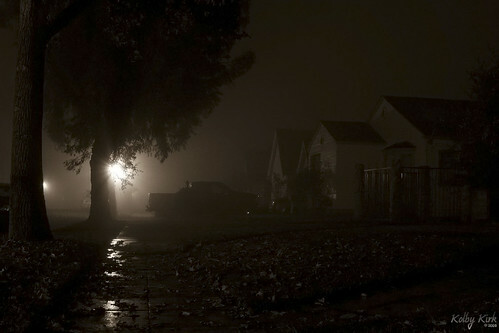 So when it rolls in, I roll out with my camera and a full tank of gas. Here are the results. I’ve had more time to sort through the treasures of National Geographic ephemera recently returned to me after years in my family’s storage. A good way to spend a Sunday. 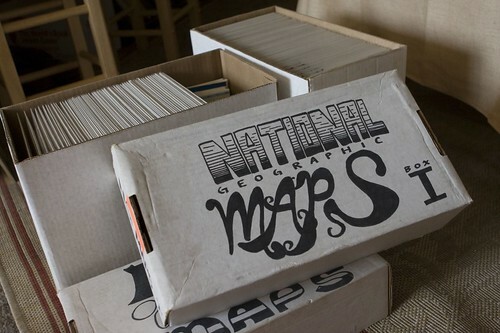 I had been a collector of comics around the same time I was a collector of National Geographic Magazines and maps, so it seemed like common sense to store the maps in comic book boxes (and comic sleeves and boards). 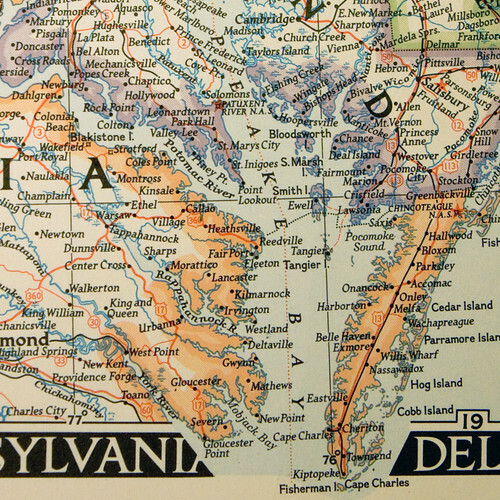 The maps in these boxes go back to 1913. I knew I had once owned a lot of issues of National Geographic Magazine, but until I found this list, I had no idea of the extent of it. At one time, I owned all but 16 issues from 1913 to sometime around 1997. I ended up keeping only the oldest of the collection and donated the rest to the local library. 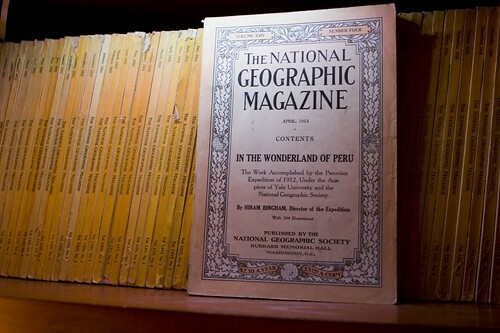 Growing up, I loved reading National Geographic Magazines. 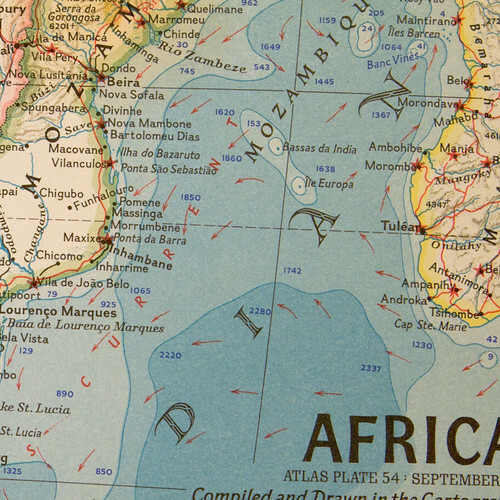 When I would get a new issue, I’d always turn to the Geographica section which reported on the newest geographic news around the world. 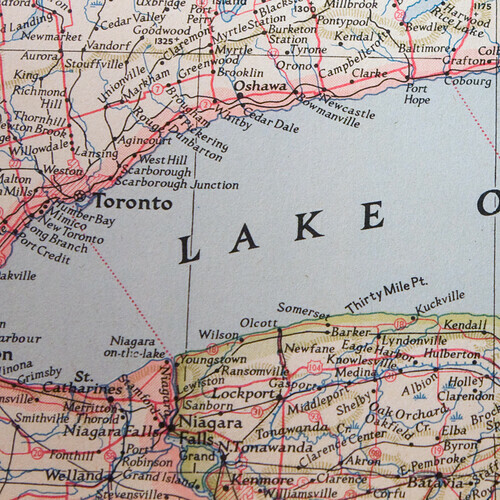 Before having to donate my large collection of issues to the local library, I had carefully compiled all of the Geographica sections into a homemade book. 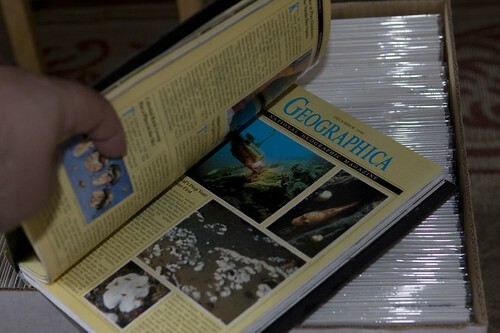 The book included every Geographica from October, 1988 (the first) to September, 1996. 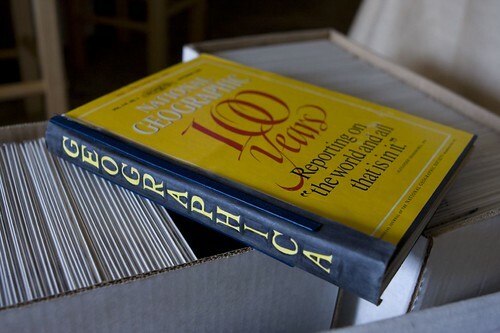 In 1995, not too long before realizing I’d have to donate most of my collection of National Geographic Magazines to the local library, I thought of creating a homemade index of all the issues released after the National Geographic 100 Year Index (1888-1988) was published. I had cut out the index of 12 issues of 1991 before giving up on the project, figuring NGS would probably release updates of their own in the future (they did). 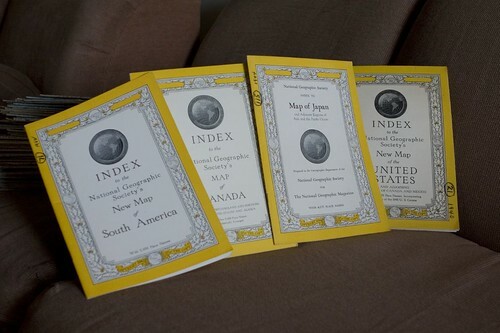 From left to right, Index to the National Geographic Society’s New Map of South America (1942), Index to the National Geographic Society’s New Map of Canada (1936), National Geographic Society Index to Map of Japan (1944), and Index to the National Geographic Society’s New Map of the United States (1940). 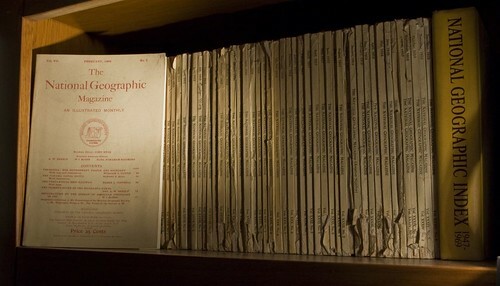 I finally had enough shelf space to take my old National Geographic Magazines out of storage. 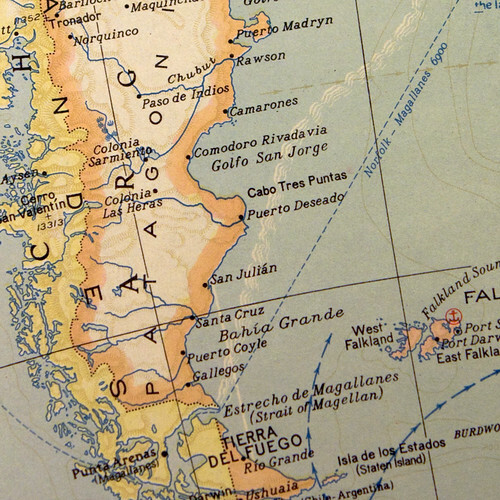 This issue discusses Hiram Bingham’s Yale/NatGeo Peruvian Expedition of 1912, his second of three expeditions to Machu Picchu and the surrounding ruins. 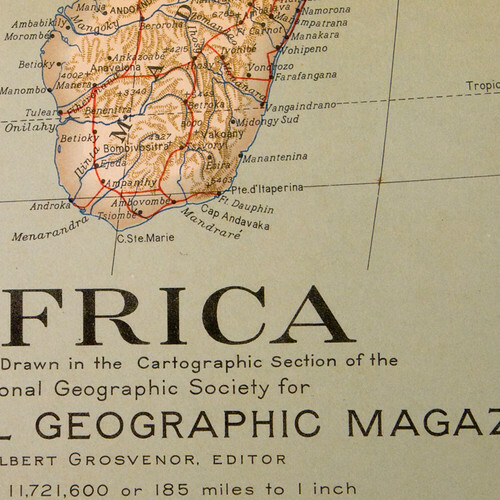 In 1964, National Geographic reprinted 1,000 copies of some of their earliest issues. This is the February, 1896 edition sitting in front of some of my earliest issues (1913-1918). 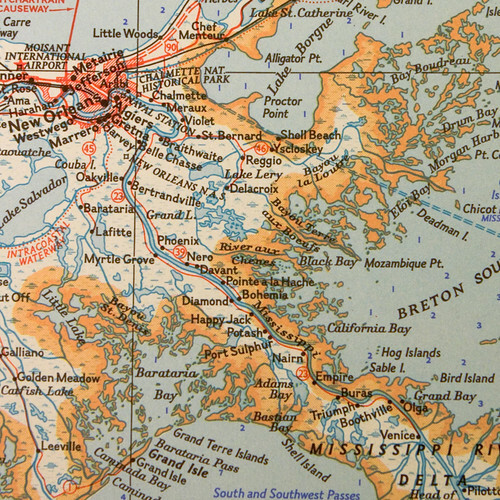 A treasure of maps was recently “dug up” in my parent’s storage space and returned to me. 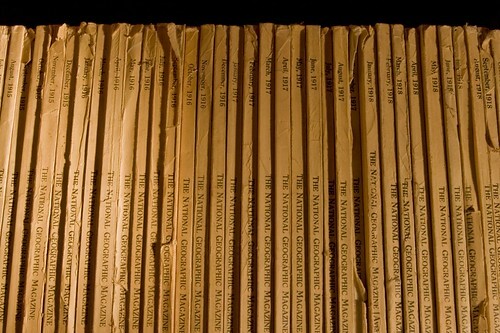 Around 1994, when I moved away from home to attend college, I was forced to get rid of most of my National Geographic Magazines – a nearly-complete collection of every issue back to 1929. However, I was able to keep all of the supplements/inserts since they didn’t take up much room. I’ve been looking through the three boxes and have found more than just maps, folded posters, and old panoramic photos. 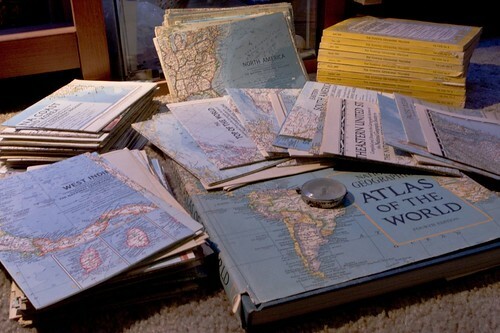 I’ve also found one of the reasons why I love travel. 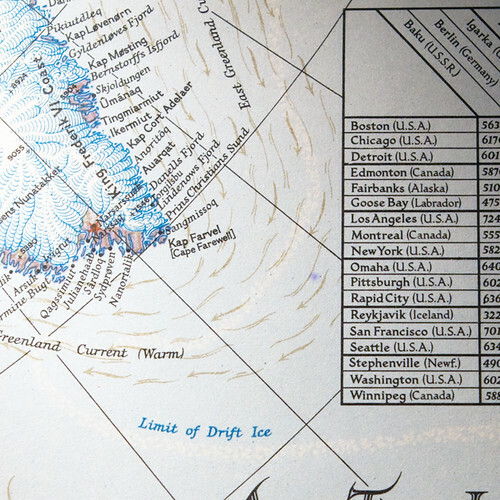 I think most people would start to feel a desire to explore the world after looking at a few maps. The beautiful and distinct fonts, the colors, the clarity. 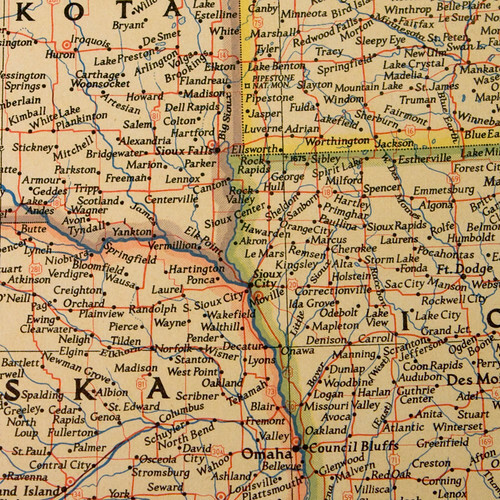 A National Geographic map is good enough to hang up on the wall and call it “art.” In fact, President Roosevelt used National Geographic maps in the White House Map Room during World War II. 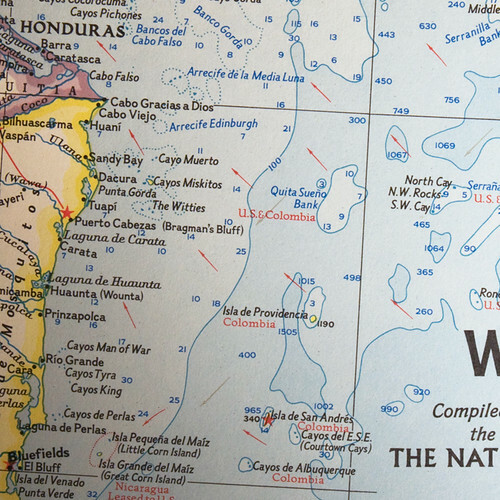 Today, a case of world maps presented by the National Geographic Society still resides in the Map Room. 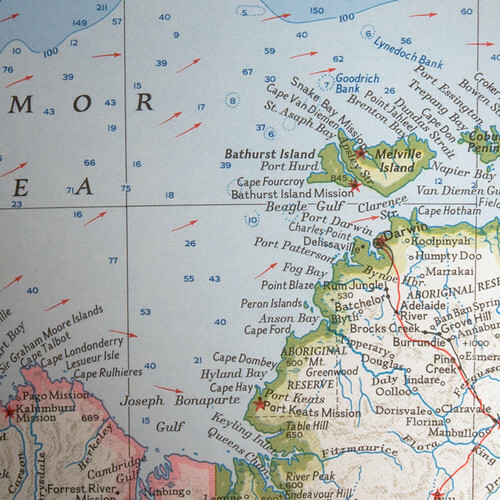 Below you will find a small selection of the hundreds of maps from my collection showing “snap shots” of the quality work National Geographic has produced in their world-famous cartographic department. If it takes a while to load or you’d like to view them in a flickr slideshow (800 x 800p res) by clicking here. 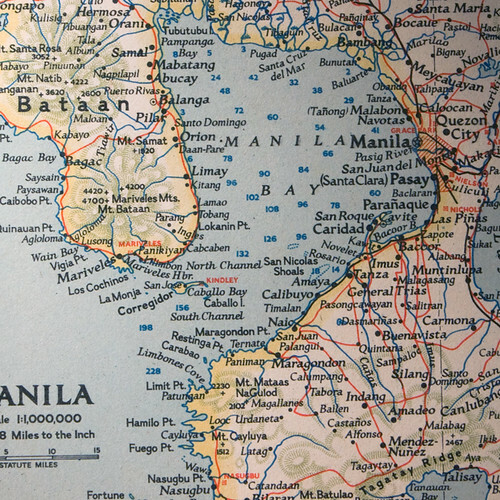 Have the urge to share a story about your National Geographic magazines or maps? Share it in the comments! 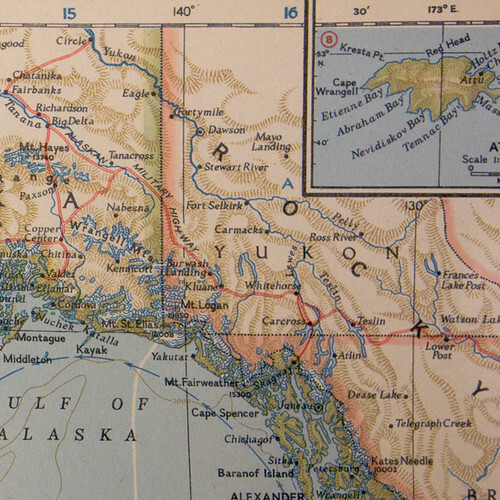 As you might remember me telling you, I recently acquired a 1911 edition of Baedeker’s London and its Environs. 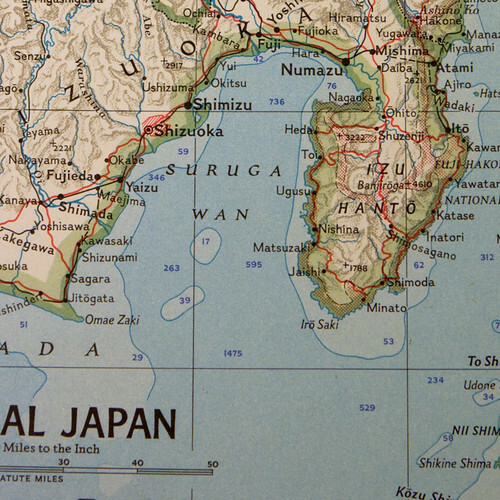 I collect well used guidebooks that have been written in by their traveling owners. 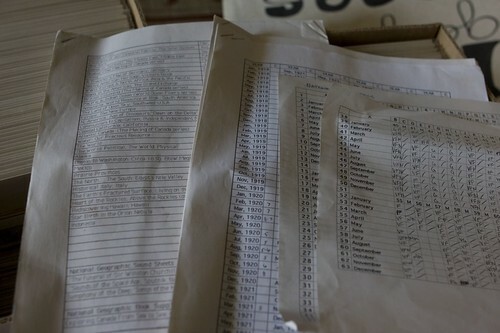 Gutters filled with notations and underlined passages excite me more than a “plain” mint condition book. 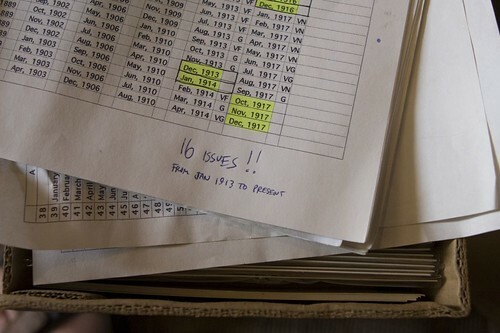 The notes tell the story of the book that is very interesting to me. Sometimes it is easy to assume where a book went with its owner and what the owner thought of the place (it’s all written in the book), but sometimes a well used book tells nothing about the owner. This book, however, is more like the latter. It is filled with underlined passages (almost every page) and all the notations are of artist’s names and works of art, but only very little clues are given about the author, whom I’ve nicknamed “The Art Lover”. After carefully studying every page and the countless pieces of art that have been underlined and added, I have begun to wonder if this book was owned by a Baedeker staff member. 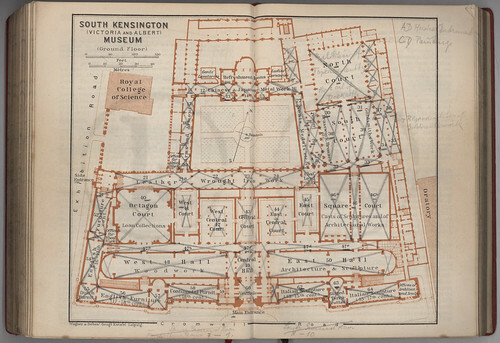 Could it be possible that the owner of the book was hired to tour the museums of London, noting any additions or changes to the artwork in the London museums? I have scanned additional pages from the book and have posted them below if you chose to help solve this 98-year old mystery. Click on the photos to be taken to Flickr, where you can view a larger version of the images. 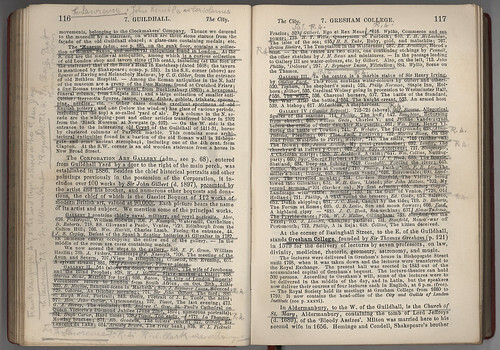 The page above works against my theory that this was owned by a Baedeker staff member hired to revise the 1911 edition. 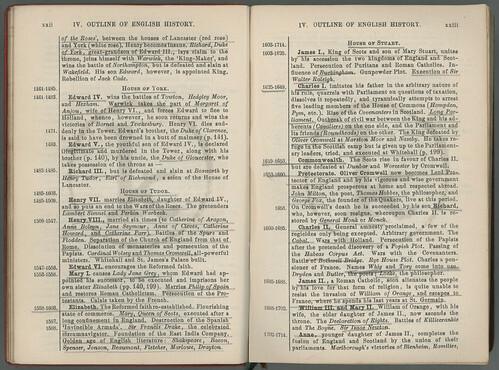 Why would text on the non-recent history of England need revising? 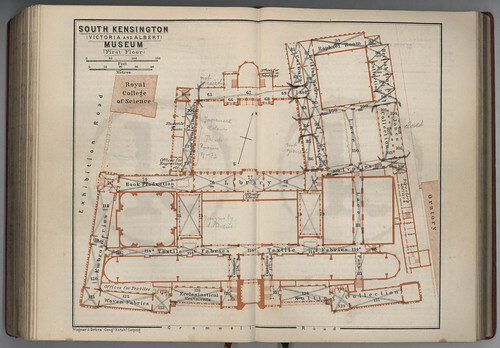 Notations on the left could indicate which museums the “Art Lover” visited or planned to visit. Notice how they noted that the Charter house was closed, an indication that tells me that they actually traveled in London. 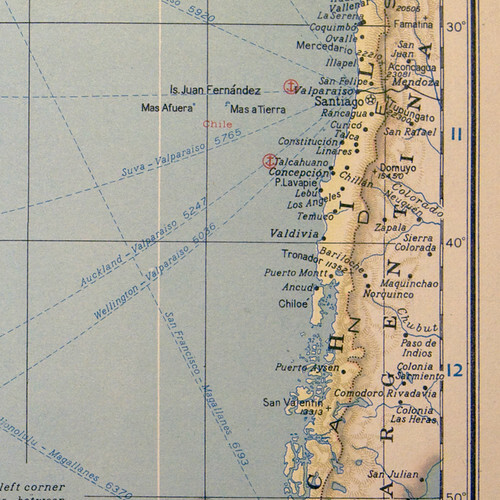 Note that the room numbers on the map had been possibly corrected. 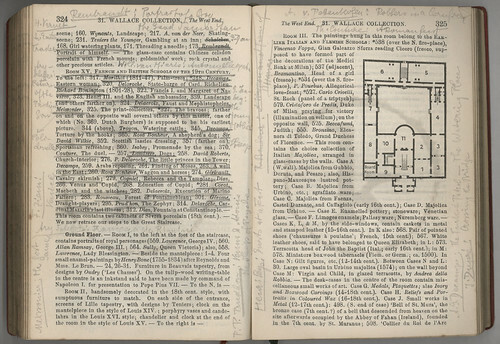 I’m assuming that marginalia that had been crossed out (like on the page to the left), it had been transposed to a notebook. 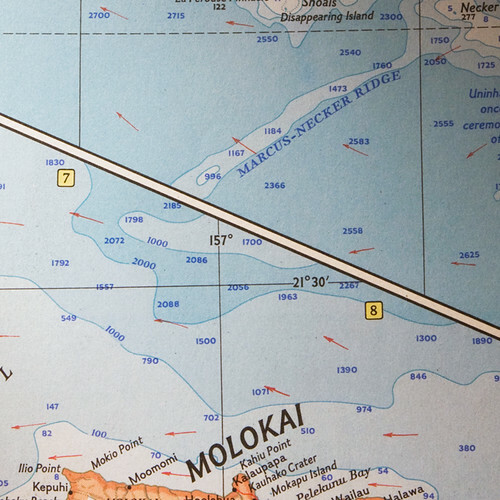 Check out the notations at the bottom of this map. Possible visitation times to this museum? 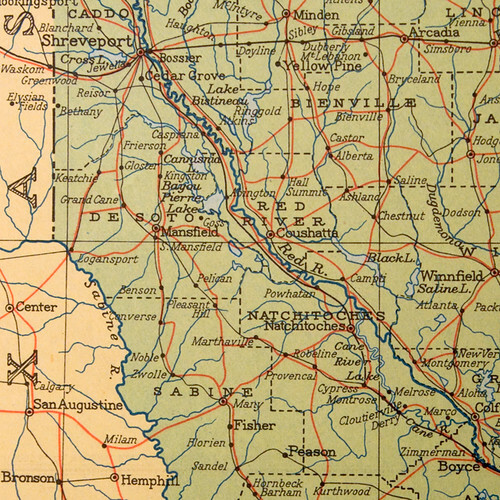 Where the map shows the Jones Collection (far right, center), the book’s owner had written that it was closed, possibly more proof that they actually entered the museum. 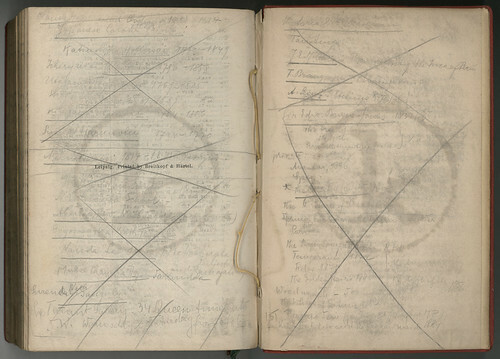 Based on marks on other pages in the book, one mark through the room could mean it was closed while two lines (forming an “X”) means it was opened and visited. Notes on artists and artwork. 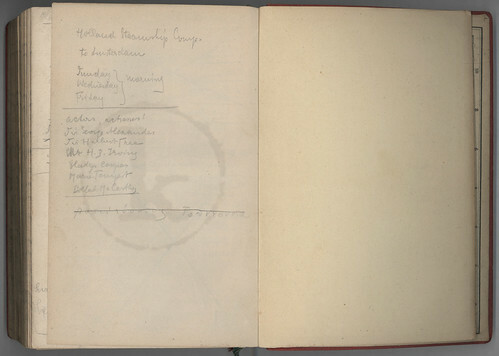 An intriguing page of notes, possibly revealing a little more about the myserious author. 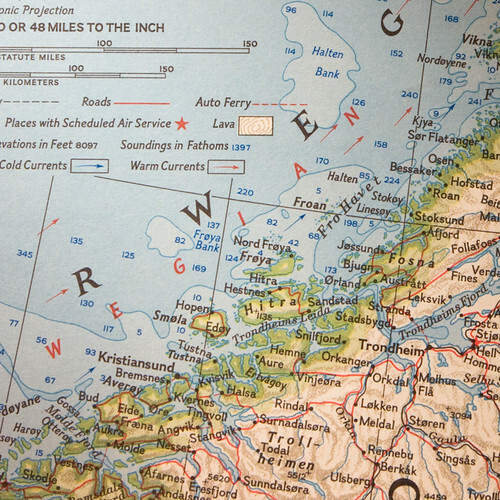 Could they have taken passage on the Holland Steamship to Amsterdam? 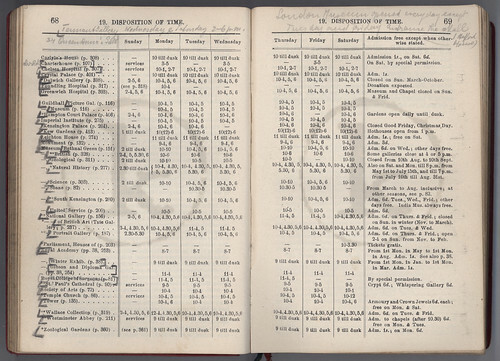 And what is that list below the steamship’s hours of operation – “actor, actress”? Feel free to leave a comment. Make sure to check out more info at my previous post. How many stores can your nose recognize? 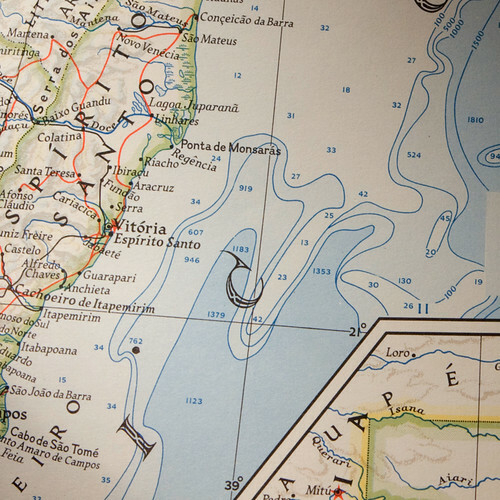 Back when Amazon was just located in South America, I spent my weekends in musty old used bookstores looking for copies of National Geographic magazines and maps. 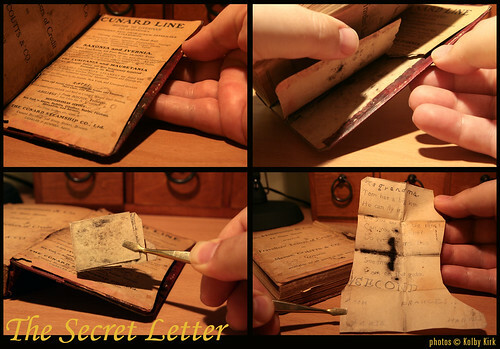 When I get an old book and carefully open its foxed pages, I always think about those summer days reading the magazines in the back of a shop. 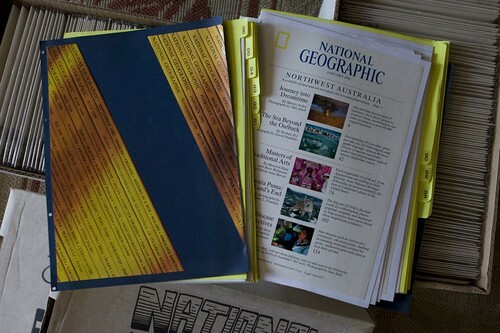 Like many National Geographic collectors, there would come a day when the wife/parents/landlord couldn’t accept the piles of yellow-bordered soft covers and they would need to be ditched. It was my parents that caused my collection to end up in front of the local library. I had amassed a collection of every issue from April 1997 (the current issue at the time) all the way back to 1932. Although a box or two of the old ones escaped donation, I still think about how cool it would be to have bookshelves filled with those golden global guides. 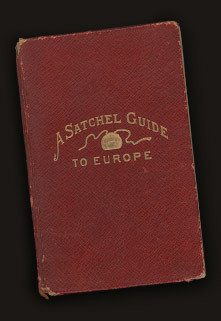 Now I’ve moved onto other musty guides: travel guidebooks from the turn of the century. I have a modest collection (under 100) that takes up a few shelves in my apartment. I’m pretty sure my place smells like a used bookstore because of them, but I don’t mind. 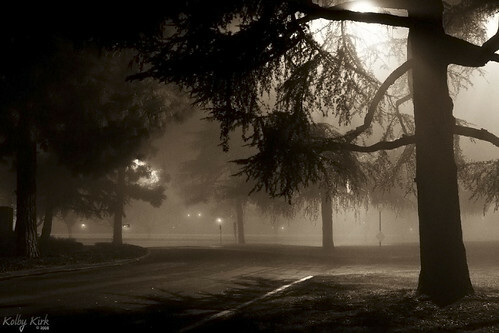 It’s the smell of my teens, a time when I could only dream of travel. 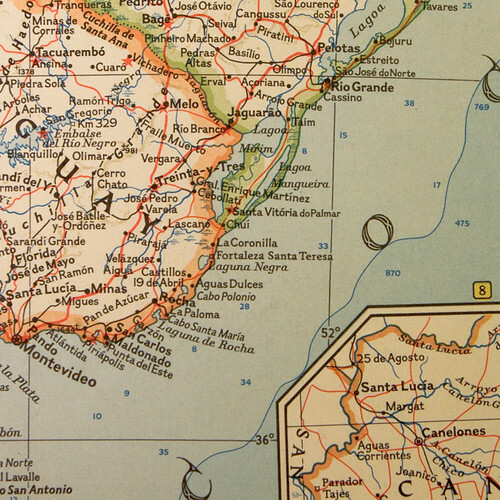 Scott Brown, editor of Fine Books & Collections magazine, has recently written a great article over at AbeBooks.com straight-forwardly entitled Collecting Travel Guides. 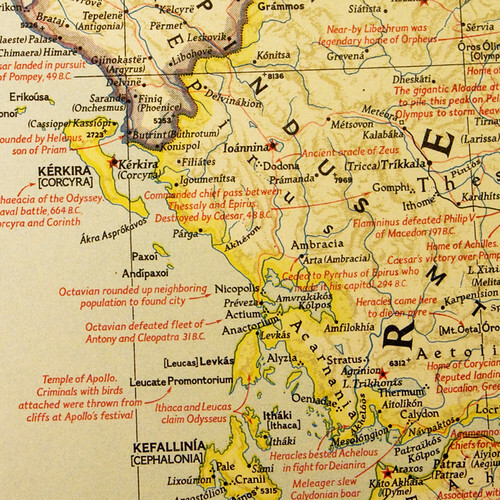 In the article, he hits upon the history some of the elderly forefathers of travel guides – Baedeker, Cook, Locke, Fodor – and shows some of the more sought-after ephemera including a “Biedermeier” Baedeker from 1852 which is currently available for sale on AbeBooks for a measely US$4,370.00. I can hear you grabbing for your credit card now. I think I’m more forgiving than most. Check out the article here when you get a free moment. 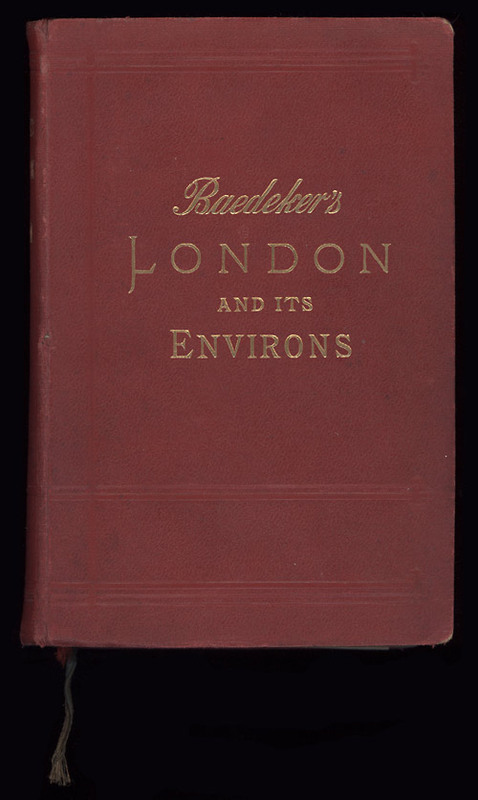 I acquired a “new” guidebook today: a 1911 copy of Baedeker’s London and Its Environs. The previous owner went wild marking the book and I love ‘em for it. 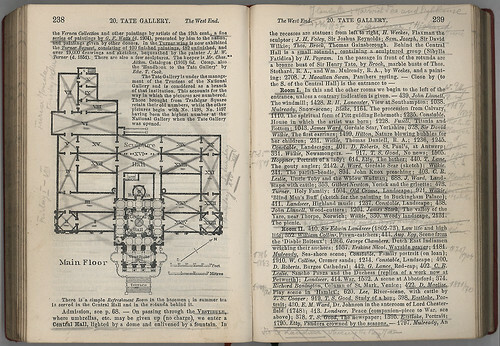 Due to the nature of the marginalia in the book, I’m calling the previous owner “The Art Lover.” Most of the markings are underlinings in pencil, but Art Lover also provided additional information about the artwork not listed in the text of the guidebook. 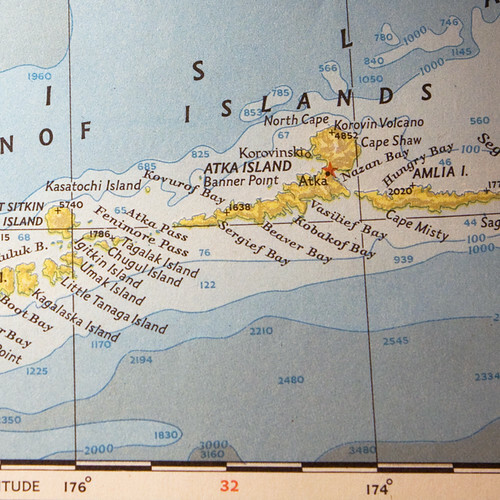 Like all the books in my collection, many assumptions have to be made about the nature of the markings. Where they using it to plan a trip? Did they have it in hand while traveling? Maybe it was perused while home, at the comfort of their study? Even with the amazing amount of markings in the book – almost every page – it looks like it might be difficult to get into the mind of Art Lover without a lot of detective work. Nonetheless, this book will make a great addition to my collection of well-used travel guidebooks and I hope to use it with my yet-to-be-opened, retrotravels.net. Here are some scans of the book. Enjoy! 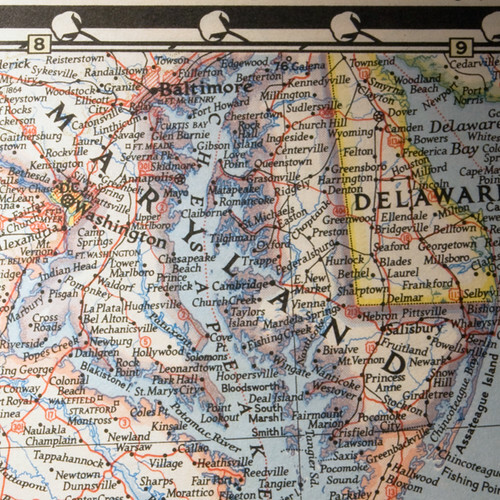 One of the joys that comes along with collecting old guidebooks is the items found within them, or “laid in.” Some refer to the postcards, metro tickets, notes, or dated paper items laid into the book as ephemera, a term I tend to use a lot to define the stuff I find within the covers of my books. But I learned of a more generic term today: flyaways. 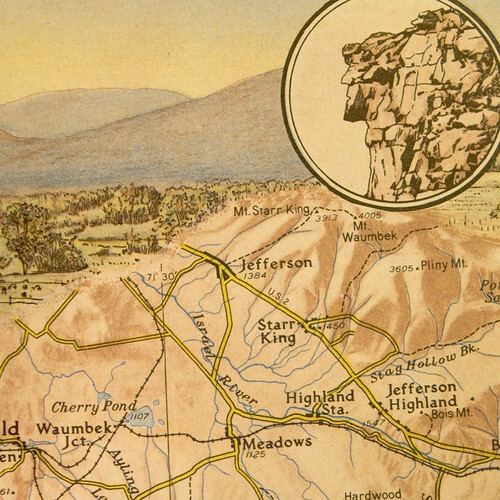 Marty Weil over at the Ephemera blog recently asked his readers to submit stories about the coolest flyaways they’ve found in old books they acquired. 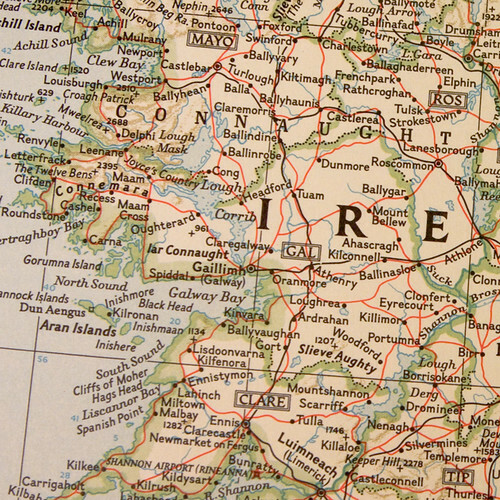 Since I have the luck of the Irish and valuable objects seem to fall from my old books, I decided to post my findings here on kk.com. Tom has a big kite. Do you see the big pine? Can you fly a kite? Do not hate me Ben. I can kick my hat. I am on the gate. 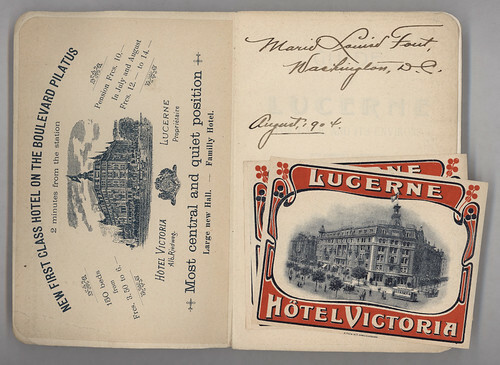 The inside cover of this guidebook had been signed by the previous owner: Marie Louise Fout from Washington D.C. Three beautiful business cards lay inside the cover – the red is as bright as if it was just pulled from the press. It is most likely that this book was guiding Marie around Lucerne over 100 years ago. My heart always jumps when I find a pressed flower among the pages of a book. I could possibly be one of the first to see it since it was laid within the pages. I imagine this flower is at least 50 years old. Some of my books have flowers that are over 100 years old – and they still have color! I’ve come to the conclusion that there hasn’t been a book published on the Griffith Observatory for over 50 years. I found this guidebook, published a year after the observatory opened – on eBay. 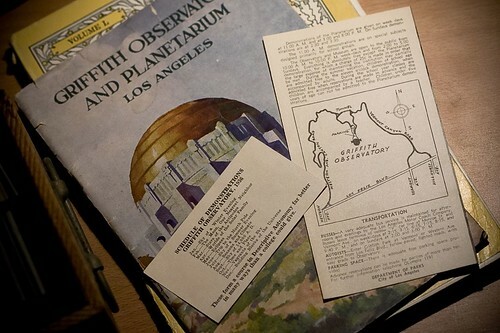 It came with two surprises: a business-card sized schedule of demonstrations at Griffith Observatory in 1936. 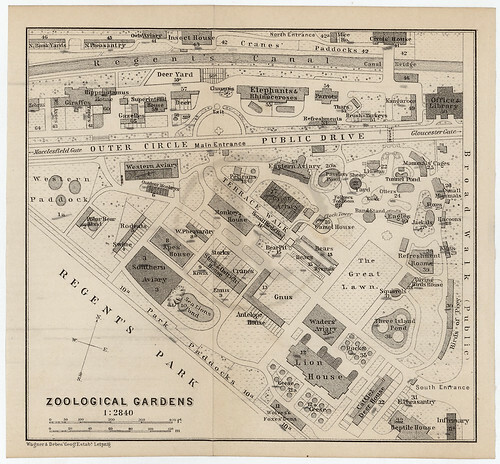 The other, a pamphlet created by the City of Los Angeles’ Department of Parks which includes a “tabloid directory of interesting exhibits.” On the back (shown in photo) is a map and transportation options. I love some of the words and phrases that have expired in LA since 1936, like “autoists,” the telephone number is listed as “Olympia 1191,” and the description of parking as being “adequate” – all definitely gone the way of the Dodo in this city. 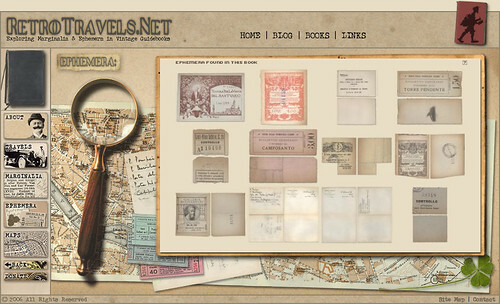 Finally, a sneak peek at retrotravels.net, a personal site that I’ve worked on off and on for almost three years. (Slowly but surely!) 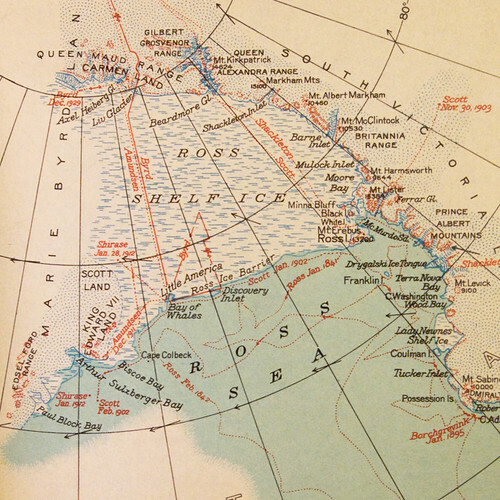 This is a design idea for displaying just some of the items found in a 1924 edition of Muirhead’s Northern Italy. 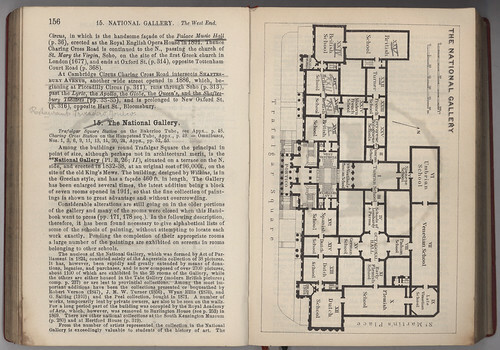 The owner of the book at the time, presumably an American, collected the tickets from the museums and galleries he visited. In Florence, he perused the Galleria degli Uffizi (visited May 25, 1925) and the Museo Nazionale del Bargello, (May 27, 1925) commonly known today as the Bargello Palace. After every visit, he threw the admission stub into this book. 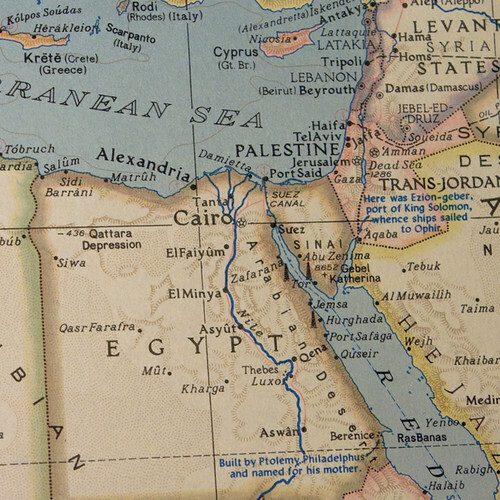 Since retrotravels.net will allow users to explore old guidebooks from my collection, I want to give the sense that they are going back in time while waiting. Do you think I should add the “percentage complete” or a progress bar underneath the watch face? Let me know in the comments section.